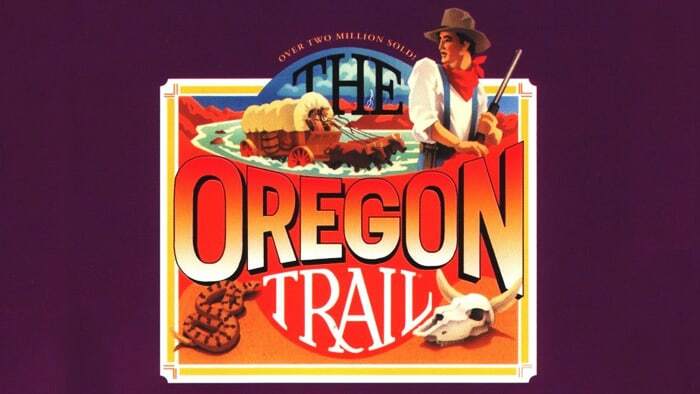 The Oregon Trail was developed way back in 1971 on university mainframes then jumped over to early 8-bit home computer systems. Continuing through 4 decades it has reappeared in many editions (at least 10), was a colossal commercial success in its heyday, and remains popular today, though interest is now largely relegated to the retro-gaming community. The Oregon Trail is a prime example of a classic computer game present at the dawn of the home computer era still fun to play today. It was ostensibly designed as a teaching tool, with the aim being to give school kids some idea what it was like for pioneer families setting out from eastern American states in the 19th century who hoped to eventually settle in distant Oregon. Sales quickly indicated its appeal reached much further than grade-level students, with hordes of adults snapping up this primordial historical adventure simulator in addition to sales to schools “en masse”. Play Oregon Trail Deluxe online! While The Oregon Trail does not approach the gameplay depth of some other more comprehensive simulation games that followed later (e.g. Civilization), and may be characterized overall as a mostly simple experience, it succeeds remarkably well in its original goal. It doesn’t shy away from depicting a spectrum of hazards and mishaps, ranging from irksome to lethal, which befell pioneers on the Oregon Trail. Granted, the depictions are highly abstract, as is appropriate considering the number of children who played the game, yet it seems probable most who play OT will find themselves trying to imagine what it must have been like to make that often brutal and uncertain journey. Moreover, if during the game you regularly stop to talk with other pioneers, The Oregon Trail will gradually reveal a significant amount of period detail and anecdote, which helps to create the aura of an authentic historical milieu. Just paying some attention to your progress on the map can be instructive. The graphic images for locations and pioneers you may encounter add in this regard as well. Beyond teaching history, The Oregon Trail is essentially a game of strategic and tactical decisions. You make choices at the start about your pioneer’s profession (banker, doctor, farmer, carpenter, etc. ); what provisions, and in what amounts, you will buy; and what month to begin the journey. All these choices have the potential to noticeably impact the success or failure of your venture. Sometimes the effects of your choices will be discovered early on, but others will not become apparent until you are deep in the thick of it, or even near the game’s end. Along the trek are many forts where you have the option of stopping and trading with other pioneers. This can be of crucial importance if it turns out your initial provisioning choices were less than optimal. Another important aspect is hunting. At any time during your journey – aside from stops at forts and natural landmarks; these places have too many people around, the game says, to make hunting feasible – you can stop and attempt to hunt wild animals. The hunting sequence is a rudimentary arcade-style interlude with wild animals traversing the screen horizontally at differing speeds, distances, and degrees of directional shift. You try to shoot the wildlife by using the mouse to control your rifle’s crosshair. Once again, in keeping with OT’s overall feel, the hunting bit, though ultimately simple, is marked by clever design and several elements that lend a surprising level of depth to the gameplay. Some animals are slow and large, easy to hit, while others are faster and harder to hit. Sometimes animals take an unvarying route straight across the screen, other times they will be constantly changing direction. And, of course, it is more difficult to shoot at the top of the screen furthest away from you. Often you will need to lead the quarry with your crosshair somewhat. Also, the frequency of animals at any given place you stop to hunt is dynamic – some places will have hordes of critters running around, other places practically nothing. One thing is certain, your party of pioneers will surely run out of food and perish if you don’t hunt. It is hard to argue The Oregon Trail is not rather brilliantly implemented, especially considering the computer hardware limitations of those elder days. Nonetheless, for me, the main interest and fun of the game was in figuring out the best strategic choices. Don’t be surprised if your first couple of tries lead to disaster. After making multiple adjustments that finally result in success it is satisfying to review your path to victory. OT’s internal logic structure is tight, and you will be able to understand how and why success was achieved through your progressive efforts. Or, at least, that is the overriding trend, as every time you play there will be many random events occurring unrelated to any choices you make. Snake bites, fractured bones, and broken wagon wheels are the order of the day. Still, if you plan carefully and adapt wisely as you learn the game’s nuances, the chances for overcoming the onslaught of obstacles OT throws at you will be good. In the final analysis, aside from the cachet inherent with being a genuine classic, The Oregon Trail is a solid game worth playing for its well-crafted resource management gameplay and the historical details and insights it provides. Good luck! You can play Oregon Trail Deluxe online here, in web browser for free!